My mother, Kim Eberly and I have been working together to strengthen and "perfect" on our own breeding programs. My mother has been raising Labrador Retrievers for upwards of fifteen years. We have been raising our Golden Retriever bloodlines for the same length of time. We have been working to better our lines all of the time and spent the past few years tentatively discussing, integrating our Red bloodlines together, to create the even "healthier" hybrid, from our already healthy bloodlines. This hybrid is referred to as a "Goldador" ~ Golden Retriever and Labrador Cross. We have done a lot of research prior to making this jump. Hybrid vigor can eliminate abnormalities that mother nature could throw at us down the road. As a result, the offspring is healthier, more robust and LARGER than the parents in most incidences. My Golden Retriever line is extremely calm and many of our puppies/adult Goldens go on to be Service and Therapy canines. This is our hope and ambition for this hybrid line as well. ​ Please feel free to contact us if you have questions. Kensie's beautiful babies are up and running around. What personalities these adorable babies have! They are eating puppy mush, demanding our attention constantly and carrying stuffy toys around everywhere. PERSONALITY ASSESSMENTS will be posted soon! Six weeks (4/16/19): Third dewormings, Third Nail Trims and Six-week weight checks. Seven weeks (4/23/19): Veterinary Examinations (Scheduled for 4/25/19), Health Certificates issued, Distemper plus Parvo vaccinations given, Eight week dewormer given throughout the week, Fourth Nail trims & Seven-week weight checks. Ready for their forever homes on April 30th 2019! ​Our Purple girl is sweet, playful and affectionate. She is definitely Confident, highly intelligent and social, with more energy this week. She has a definite love of stuffy toys and is very food motivated. She does not startle easily and tends to enjoy playing independently. However, when we engage her, she focuses and interacts with us readily. We anticipate her adult weight to be around 70-75lbs. ​Our yellow girl is playful, affectionate girl, whom also seems very confident at a young age. She is social, happy all of the time, seems fearless in everything and loves us all. She is as pure of soul as they come. She does have great focus during one on one assessments. Her alert disposition and food motivation will make her training much easier. She is a lover of all stuffies, she enjoys being cuddled and her kisses and tail wags are endless. Her anticipated adult weight is around 65-70lbs. 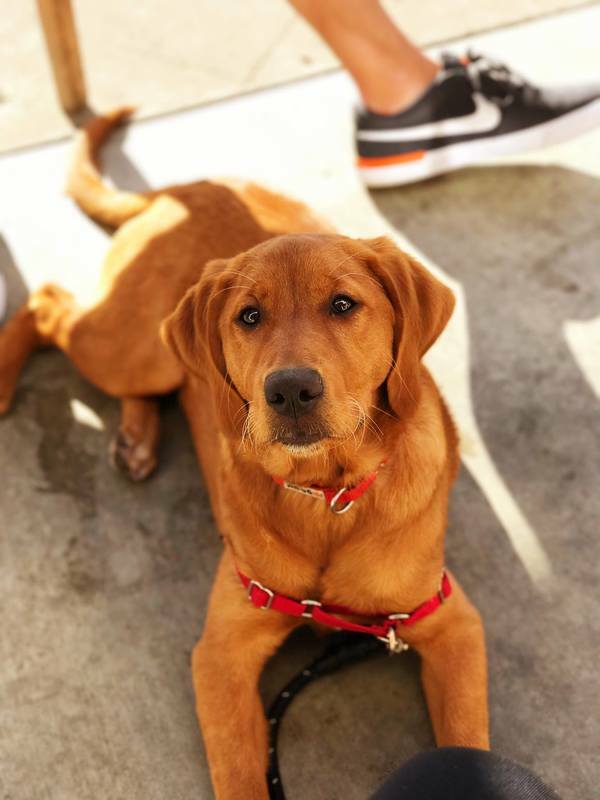 Our Red girl is a genuine leader of the pack, with the most happy energy of the litter. She is a Confident, sweet, affectionate, playful girl, with a lot of love to give. She is definitely a social butterfly, whom loves everyone she meets and approaches life fearlessly. We anticipate her to reach about 70-75lbs at adulthood. Our teal is a calm, easy going, mellow boy. He is always happy, has great confidence and responded extremely well to assessments. He actually has a lot of potential for Service/Therapy work. He is of high intelligence, alert and focus with very little forced distraction. His response to loud noises is impressive. If he startles at all, he recovered immediately. He is still playful, a big cuddler and a lover of all stuffy toys. He is also very food motivated. We anticipate his weight to be around 80-90lbs at adulthood. Our pink girl is a Kind and gentle soul. She is highly intelligent, focused and does not startle easily. She carries herself with confidence and affection for everyone she meets. She does move at a slower speed and due to that more mellow disposition, she tends to focus on us longer and it seems that she will handle training very well. Our pink girl has a lot of potential for Service/ Therapy work. We anticipate her adult weight to be around 70-75lbs.